Oxenhope Village01535 642329work VillageOxenhope is a small village close to Haworth, once home to the Brontes. It is the terminus for the Keighley and Worth Valley Railway a steam railway that stops in Haworth, Oakworth, Damems, Ingrow (West) and terminates in Keighley. The village is also well-known for the The Oxenhope Straw Race, a team event in which competitors complete a 2.5 mile course around the village carrying a bale of straw and stopping at each pub on the route for a pint of beer. Many contestants choose to dress up in costumes. The event benefits local charities and always draws many spectators. 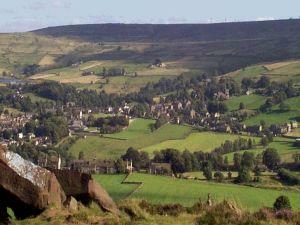 Oxenhope is a small village close to Haworth, once home to the Brontes. It is the terminus for the Keighley and Worth Valley Railway a steam railway that stops in Haworth, Oakworth, Damems, Ingrow (West) and terminates in Keighley.